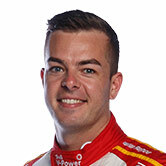 Scott McLaughlin continued his strong start to the CrownBet Darwin Triple Crown at Hidden Valley by leading the way in Practice 3 on Saturday. 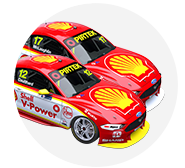 The Shell V-Power Racing driver turned a 1:06.1410s to set the pace, with Red Bull Holden Racing Team driver Jamie Whincup his closest challenger. Friday pacesetter McLaughlin first moved to the top of the order after eight of the 45 minutes with a 1:06.2096s to displace initial leader David Reynolds. They remained first and second, followed by Rick Kelly and Fabian Coulthard, for the bulk of the session. Running was halted with just under 15 minutes to go, when wildcard runner Macauley Jones crashed at Turn 11. 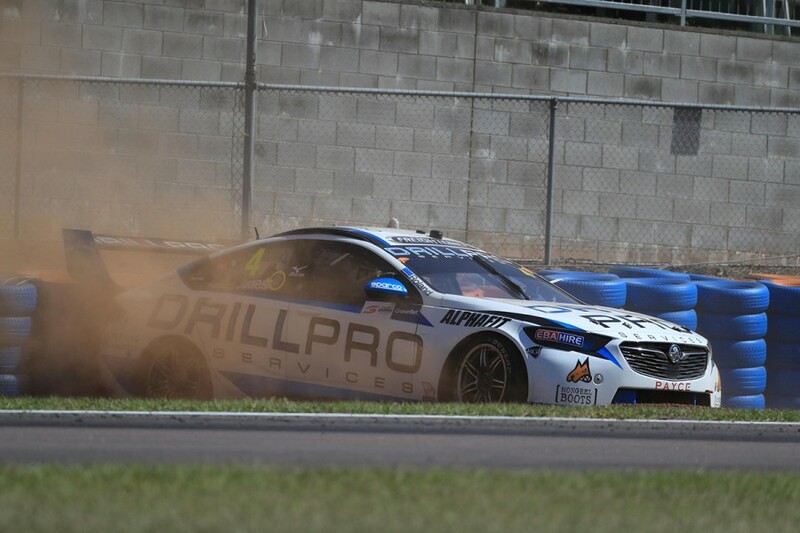 Jones lost the rear end turning in, the ensuing left-rear corner contact with the tyre barrier damaging the DrillPro Commodore. The Dunlop Super2 Series driver was 13th in the order at the time and took no further part, falling to 21st. A host of drivers made gains immediately after the restart, entering the final 10 minutes, including James Courtney, Anton De Pasquale and Scott Pye jumping up into the top six. With three minutes to go, McLaughlin lowered the benchmark to 1:04.1410s, as Whincup jumped up from 14th to second, 0.1747 seconds adrift. That was how the order remained, with McLaughlin topping two of the three practice sessions ahead of qualifying. “There’s a little bit for me to work on just in regards to driving,” the championship leader said. “There were a couple of differences with Fabian [Coulthard] taking the corners, so I’m working on myself. “We spent a lot of the session doing that, we only did a couple of little [car] changes. Reynolds had to settle for third place, the Erebus Motorsport driver making a mistake at the final corner on his last effort. Courtney remained fourth, ahead of lead Nissan Rick Kelly and Brad Jones Racing’s Tim Slade. “There’s a significant shift in the track yesterday to today, which we’re fighting a little bit,” Kelly, who first and second in Friday’s sessions, said. “We’re fifth at the moment and we had a car good enough for first yesterday. “The biggest shift I think is in the wind, it’s pushing us into Turn 1 and it gets under your tail mid-corner and brings in a bit of oversteer, and it’s the same at 5 as well. “We’re trying to combat those things and trying to calm the car back down, while trying not to upset other areas where it’s really good. Shane van Gisbergen moved up from 13th to seventh with his final effort, while Craig Lowndes also made late gains to be 10th. The Triple Eight stablemates were split by Fabian Coulthard and De Pasquale, who was the best of the rookies. Chaz Mostert led the way for Tickford Racing in 12th, with team-mates Mark Winterbottom 16th, Richie Stanaway 20th and Cameron Waters 22nd. ARMOR ALL Qualifying starts at 1:05pm local time, before the 42-lap, 15th race of the Virgin Australia Supercars Championship at 4:15pm.